Garage door openers tend to malfunction occasionally, and when that happens the best thing to do is call in professional help. Dealing with such complex electro-mechanical devices can be dangerous, and it can also lead to more serious problems if the right solution isn't implemented. We’ll Get It Open For You! There are many reasons that your opener might not be working, our technician will quickly diagnose the problem and repair the problematic part or replace it with a new one. We have a lot of experience performing various opener repair tasks, so you can count on us to find the fastest and most effective way to resolve any issue. The problem may be with the opener remote, which may need to be reprogrammed or replaced completely. The problem could also be an electrical one. This tends to happen after power surges or unexpected outages. Our technicians will check to make sure everything is plugged in correctly and that the circuit board and electrical wires are all in good working order. If something isn’t right, we’ll fix it on the spot. The problem could also be mechanical. Our technicians are knowledgeable in this area as well, and can solve any problem with the motor gear or the rail system quickly and in a safe manner. The drive-system could use some adjustment or lubrication, depending on its type. You can trust us to perform the required task to make it return to its fully functional. We work with openers made by all of the biggest brand names on the market, such as – Sears, Windsor, Chamberlain and others. Regardless of which brand or model you have, some regular maintenance is imperative. With our scheduled service appointments, we'll be able to make sure your opener is in a great condition. We'll make sure the safety sensors are properly aligned and that the door is safe to use, and that no hidden problems are lurking about. 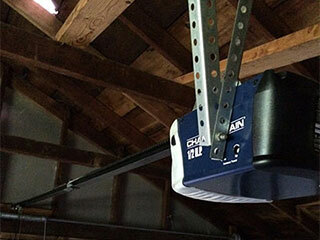 If you have any questions about our services and the brands we carry or if you want us to repair your garage door opener, please don’t hesitate to give our team at Garage Door Repair Maple Valley a call today.